BimmerWorld Racing is proud to announce a two-car entry for the SRO TC America Championship (formerly Pirelli World Challenge), running in all seven races beginning with the opening round at Circuit of The Americas in Austin, Texas on March 1-3, 2019. 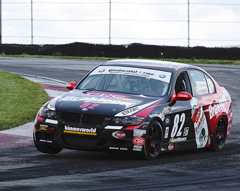 The new team marks a full-time touring car return for James Clay’s BimmerWorld squad after a nine-year full-season gap and features the professional series debuts of Cameron Evans (No. 82) and Chandler Hull (No. 94) in a pair of BMW M240i Racing entries. The new TC America championship and its Touring Car (TC) category features a seven-event championship with 40-min sprint races at many of the most legendary road racing circuits in the United States; such as VIRginia International Raceway, Sonoma Raceway, Road America, and Watkins Glen International. Additional sponsorship for the team comes from OZIUM Air Sanitizer, Cyclo Industries, Red Line Synthetic Oil, Lifeline Fire and Safety Systems, AMP Research, and Performance Friction Brakes. 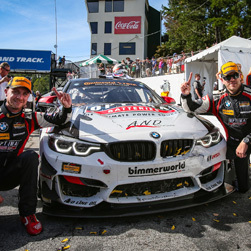 The fan-favorite BimmerWorld Racing team will return to IMSA competition in 2019 with a strong championship effort. The winner of the final race of the 2018 IMSA Continental Tire SportsCar Challenge series at Road Atlanta in October, and third place in the year-end GS class championship, will compete in the newly named IMSA Michelin Pilot Challenge series. Team owner James Clay will return to the driver’s seat in the Grand Sport (GS) class, paired with Devin Jones of Mooresville, N.C.
OPTIMA Batteries will return as a primary sponsor, along with Veristor, and Red Line Oil, Performance Friction, Lifeline Fire and Safety Systems, and Johnstone Supply will continue as team and technical partners for the IMSA effort. Clay and Jones will compete with the car number 82 once again for 2019. The No. 82 BimmerWorld BMW M4 GT4 will be on track at Daytona International Speedway during the Roar Before the 24 test days, January 4-6 and then for Round 1 of the Michelin Pilot Challenge series for the BMW Endurance Challenge 4-hour race on Friday, January 25. ABOUT: BimmerWorld is renowned as a leader in BMW aftermarket and tuning expertise. It competes in the IMSA Michelin Pilot Challenge series in the Grand Sport (GS) class with a BMW Motorsport M4 GT4, where the Virginia-based outfit has become a routine winner and championship contender, as well as the 2018 ST class champion. The BimmerWorld Racing team fulfilled an important goal this past weekend at the legendary WeatherTech Raceway Laguna Seca circuit in the IMSA Continental Tire SportsCar Challenge race with a pole and win for their special entry to support the fight again Alzheimer’s. Nick Galante, of Greenfield, Mass., qualified the BimmerWorld Racing No. 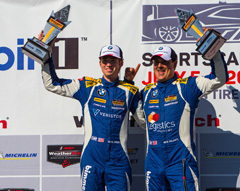 81 Veristor/Legistics BMW 328i (F30 chassis) and captured the team’s eighth ST class pole in nine races with a time of 1:39.831 at 80.704, his fifth pole this season. He and teammate Devin Jones, of Mooresville, N.C., maneuvered their Bimmer to a near perfect WeatherTech Raceway Laguna Seca 120 two-hour race and straight to the Winner’s Circle. Additionally, they depart Monterey, Calif. with a large points lead in the ST class 2018 points championship with one race remaining. The highlight of the race was putting the No. 81 BMW 328i into Winner’s Circle as they lead a strong effort this season to fight Alzheimer’s. Their car has carried a special “Racing to End Alzheimer’s” color scheme on the front fenders all season, but this weekend the team elevated their awareness campaign. In place of corporate sponsors, fans and viewers saw the names of people affected by Alzheimer’s in a tribute generously provided by donors to the ‘Racing to End Alzheimer’s’ foundation. With 100 percent of the funds they collected being donated to Alzheimer’s-related organizations and a special bonus from the foundation’s sponsors who generously agreed to match every donation, a victory was the icing on the cake. The sister car, the No. 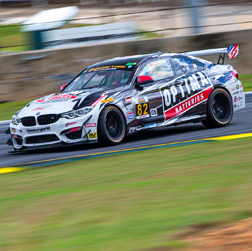 82 OPTIMA Batteries BMW M4 GT4 of team owner/driver James Clay, of Blacksburg, Va., and Tyler Cooke, of Fort Lauderdale, Fla., started tenth and finished just one position lower, in 11th place. The unpredictable race saw two competitors run out of fuel on the final lap of the 70-lap race. The Continental Tire race started under sunny conditions and with a 36-car field on the 2.238-mile, 11-turn road course. Clay was the starting driver of the No. 82 BMW M4 GT4 from the 10th place in the GS class while Galante had the enviable pole-sitter position in ST in the No. 81 BMW 328i. Both drivers had a strong start with Clay climbing into ninth place on the first lap and Galante holding his lead from a pack of hungry ST competitors. Both drivers turned their fastest laps of the race in the opening round. Galante’s fastest lap came on Lap 3 with a time of 1:40.863, while Clay’s fastest was on Lap 4 with a time of 1:34.835. On lap 25, Clay pitted for tires and fuel with no driver change while under caution and 51 minutes into the two-hour race. Galante then pitted on Lap 27 for tires, fuel, and driver change to Jones before the track went green one lap later. He went out in fifth position but quickly moved up to third by Lap 33 and second place one lap later, but having pitted before the halfway point, had to diligently work to save fuel for the majority of the race. Clay had advanced to fifth in the competitive GS class before pitting on Lap 36 with 54 minutes remaining in the competition. The rules stipulate that each driver must drive for a minimum of 45-minutes, so pit stop timing is always critical in IMSA competition. Cooke entered in 16th position and had to go straight to battle. Jones continued his fight with a MINI in front and a Porsche behind until Lap 60 when he pushed his BMW 328i past the MINI to take back the ST class lead, which he held to the checkered flag and had a 9.221-second margin of victory. Cooke slowly climbed up the leaderboard as he passed the GS field that was spread out due to second pit stops, and eventually crossed the finish line in 11th place. Both cars managed critical fuel strategy of preserving fuel while maintaining race pace. Galante and Jones continue their ST class points lead with only one race remaining. They have a strong lead with 292 points (unofficially) with the second place point holder, Mat Pombo, with 276 and third-place, Jason Rabe/Max Faulkner, with 269 points. Clay and Cooke are unofficially in fourth place in the GS class with 217 points to the leaders’ 261. The finale for the 2018 season will be the Fox Factory 120 at Road Atlanta on Friday, October 12. The WeatherTech Laguna Seca 120 race will air on FOX Sports 1 on Sunday, September 16 from 7:00 – 9:00 a.m. Eastern time. “It was a challenging weekend for us. We had an issue that we resolved on test day, but it doesn’t really matter because Laguna is always challenging because of the surface and total lack of grip. We had a very frustrating day yesterday in practice. We threw a lot at the car and we were not able to get it to work. We thought on it overnight and put a whole new set up on the car and made it happen and today was a much better day, but it still wasn’t a great day. I think that we got what we could get out of the car. If you drove a BMW, this just wasn’t your day in GS. 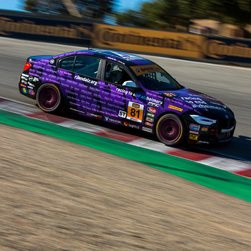 BimmerWorld Racing has its sights not only on Laguna Seca’s Victory Lane this weekend but also on the fight against Alzheimer’s disease. The No. 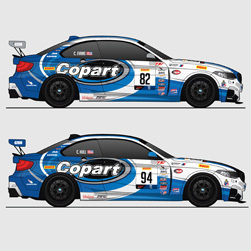 81 Veristor/Legistics BMW 328i (F30) will run the IMSA Continental Tire SportsCar Challenge race with a striking livery of names affected by Alzheimer’s as the team and drivers hope to raise awareness and funds for Alzheimer’s research. Nick Galante is one of the drivers of the No. 81 BMW 328i and is leading the team’s effort to fight Alzheimer’s. Their car has carried a “Racing to End Alzheimer’s” color scheme on the front fenders all season, but this weekend the team is taking the purple theme to new heights. In place of corporate sponsors, fans and viewers will see the names of people affected by Alzheimer’s in a tribute generously provided by donors to the Racing to End Alzheimer’s foundation. One hundred percent of the funds will be distributed to Alzheimer’s-related organizations with a special bonus from the foundation’s sponsors who generously agreed to match every donation. Monterey and Laguna Seca occupy special places in the heart of both BimmerWorld 328i drivers. Galante has a long history with Laguna Seca and his co-driver, Devin Jones, often visited the track with his father while growing up in California. Jones feels at home on the track and has high expectations as the season winds down. The Galante/Jones duo are currently leading the ST class championship with just two races remaining. Also in the title hunt is the No. 82 OPTIMA Batteries BMW M4 GT4 of James Clay and Tyler Cooke. They have been near the top of the title standings all season long, despite some setbacks with their new-for-2018 car. They are currently in fourth place overall with just two races remaining. Laguna Seca is famous for its low grip and emphasis on braking as much as it is for it’s twisty layout. The M4 GT4 will be sporting a special brake compound this weekend thanks to the team’s technical partner Performance Friction Brakes. Even with the season drawing to a close the team is not looking past this weekend. Maximum points must be captured if the team wants to stay as title challengers. The BimmerWorld team hits the track for practice sessions at the 11-turn 2.24 mile course on Friday, followed by qualifying on Saturday morning. The two-hour race is Saturday afternoon at 3:15pm PT. Live race broadcasts can be seen on IMSA.TV, or the rebroadcast can be seen one week later on September 16 at 7:00am ET on FoxSports 1. This is the penultimate race of the season. Rate the year so far for both the GS and ST classes for BimmerWorld. How do things look going into the Laguna Seca race for the BMWs in each of the two classes entered? Braking is critical at this circuit. Talk about which turn require the most finesse and how you manage braking at the 2.238-mile, 11-turn road course. Last year was a 4-hour race at Laguna and this year it’s back to a 2-hour Continental Tire race. Which do you prefer and why? You’ve had a pretty good year with the new GT4 BMW, how confident do you feel going into the Laguna Seca race this week for a good result? At last year’s race, you had a pin issue that sent the hood up on the windshield at the beginning of the race, and then another driver made contact with you causing a spin so you had to play catch up all race. What’s the strategy going into this year’s race? What kinds of things do you like to do in the Monterey area? What’s your strategy this weekend to maintain your points lead with just the final two races to go? Share your thoughts about the Laguna Seca circuit and both your favorite and most challenging parts of it. At Laguna Seca, you race counter-clockwise. Do you have a preference for racing clockwise or counter-clockwise and why? Share your favorite Laguna Seca story and what makes it a special track. What corner, or group of corners, do you like best at Laguna Seca and why? Tell us about your most memorable race at Laguna Seca. You’ve got a lot of weight on your shoulders to maintain the lead in the ST points championship. Does that kind of stuff get in your head? If so, how do you manage it and stay focused on racing? How much of a dog-fight do you expect it to be this weekend among the ST competitors? What kinds of things do you like to do in the Monterey area while you’re there? 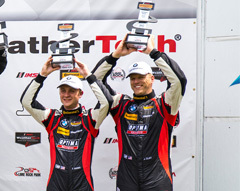 The only goal on the minds of BimmerWorld Racing drivers Devin Jones and Nick Galante was to add a third victory to their 2018 IMSA Continental Tire SportsCar Challenge season total during the action-filled Road America 120 last Saturday at Road America. Not only did they win, but their victory allowed them to extend their points lead in the Street Tuner (ST) class championship with just three races remaining in the 10-race season. BimmerWorld Racing also competes in the Grand Sport (GS) class, where team owner/driver James Clay of Blacksburg, Va. qualified the No. 82 OPTIMA Batteries BMW M4 GT4 in sixth place with a time of 2:30.311 and an average speed of 103.860 miles per hour. His longtime teammate, Tyler Cooke of Fort Lauderdale, Fla., drove the second half of the race and took the checkered flag in ninth place in the GS class on lap 44 in the two-hour race in what ended up being a wild game of fuel conservation and pit strategy. Galante won the pole in the ST class with the No. 81 Veristor/Legistics BMW 328i (F30 chassis) with a qualifying time of 2:31.968 at an average 95.393 mph, and he was the starting driver of that car. His co-driver, Devin Jones of Mooresville, N.C., took the BMW to the finish and victory circle. Together they dominated the class, leading 47 laps to their closest rival’s 11. There were two full-course yellows during the race, including one on lap 15 when a GS-class car went off track, flipped, and caught fire. The lengthy caution period enticed many cars to the pits and a number of different strategies developed regarding fuel mileage. Exactly when each car pitted for fuel, tires, and its driver change during the nearly 30-minute caution precipitated who would need to pit for fuel before race end. Galante, in the No. 81 BMW 328i, had a good early battle but maintained the lead before pitting during the caution, and bounced down to fifth in the ST class after the pit stop and driver change to Jones. He was quickly back to second after some very competitive racing with the three MINIs. He finally passed the leading No. 73 MINI of Mat Pombo with just over 30 minutes remaining in the race. Jones took it to the checkered flag and won over Pombo by 6.724 seconds. As cars pitted and shuffled the order, the No. 82 BMW M4 of Clay pitted immediately during the caution and was able to move up as high as second place but pitted once more to top off with fuel and change drivers, putting them in 18th place in class for the restart before Cooke started moving up the leaderboard. A number of the leaders had to pit for a splash of fuel or had unexpected off-track excursions, which played to BimmerWorld’s strategy with the late-caution stop and moved the No. 82 up as high as 6th. But even without the heavy fuel conservation pace and the extra fuel from the late stop, the top GS car ran all the way to the finish without fuel issues, leaving Cooke and Clay with a top-10 finish. Jones and Galante extended their lead in the ST class championship. They now lead by 11 points with 225 to their nearest rivals’ 214. Clay and Cooke are fourth in the GS point standings, just eight points out of the lead, with 183 points to the leaders’ 191. 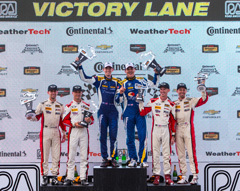 The Road America 120 race will air on FOX Sports 1 from 9:30 a.m. to 11:30 p.m. Eastern time on Sunday, August 12. The next race for BimmerWorld Racing is the Biscuitville Grand Prix for the IMSA Continental SportsCar Challenge, a two-hour race, scheduled for August 18 at VIRginia International Raceway in Alton, Va. The BimmerWorld Racing team is eager to get to its home track and try to double up on the race victories. The BimmerWorld Racing team is ecstatic to get back on track at their collective favorite circuit as the IMSA Continental Tire SportsCar Challenge series advances to the beautiful Road America circuit this weekend for the Road America 120, round seven of 10 in the 2018 season. Nick Galante of Greenfield, Mass. and Devin Jones of Mooresville, N.C., drivers of the No. 81 Veristor/Legistics BMW 328i (F30 chassis), lead the ST class points championship with four races remaining as they enter the race weekend. The Grand Sport (GS) co-drivers of team owner/driver James Clay of Blacksburg, Va. and Tyler Cooke of Fort Lauderdale, Fla., in the No. 82 OPTIMA Batteries BMW M4 GT4, are currently tied for second place and four points out of the GS class lead. Clay qualified on pole in ST here last year; he and Cooke finished sixth. In an odd turn of events, the race was halted with 47:37 remaining due to lightning in the area. While weather can always be a factor in the Wisconsin farmland, rain does not bother this quad of drivers. Road America, a 4.048 mile, 14-turn road course that runs clockwise, has three straights on which drivers are going over 150 mph. With approximately five critical hard-braking zones and four or five where brake release is critical to corner speed, the BimmerWorld Racing team has called out the strength of their Performance Friction brake package as a critical factor to the race. With a track where slowing the car and transitioning into fast mid-corner speeds is so critical, these packages designed for the ST machine and more recently applied to the GT4 by the long-time technical partners at PFC are in the spotlight. Although winning is always a goal, staying atop the point charts at this crucial point in the season will be on their minds this week. A promoter’s test day will be held on Thursday, and the BimmerWorld team plans to use that opportunity to make sure the setup of the cars are ready for Friday’s official practice sessions. Practice begins on Friday, August 12 at 9:55 for one hour, and again from 3:05-3:55 p.m. Saturday features Practice 3 from 10:15-10:30 a.m., followed by ST qualifying from 10:40-10:55 a.m. and GS qualifying from 11:00-11:15 a.m. The race is Saturday afternoon from 4:05-6:05 p.m.
Live video coverage and live timing and scoring of the race will be offered on imsa.tv and imsa.com. The race will also air on FOX Sports 1 on Sunday, August 12 from 9:30-11:30 a.m. All times are Eastern. You have said Road America is one of your favorite tracks. What are the elements of the track you like so much and why? Do you think competing here already once this year will help you? Weather can be unpredictable at Road America like last year when the race was ended with 47 minutes to go due to lightning in the area. 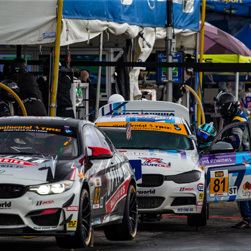 How do you prepare for difficult racing weather as both a team owner and as a driver? The long lap times at Road America mean you have fewer laps to get your set-up right in the practice sessions. Do you come to the track with your best-known set-up and just tweak from there with regard to weather and other conditions? You had the pole last year. Do you think you can repeat that this year? If so, what will it take? You and Tyler seem to really have gotten into a groove as co-drivers. What makes a good co-driver/teammate in your eyes? James had the pole here last year and you were second on the grid the year before. What does it take for fast lap times at the Road America circuit? You and James finished sixth last year with the abbreviated race. What’s been your best result at Road America during your career and share your thoughts about the circuit. You and James are tied for second in the championship points. Do you ever get think about the points standing during a race weekend and do calculations? Does it ever get in your head? You and James have been able to manage really clean racing this year without really any on-track incidents. How do you manage that in the heat of some of these intense battles? You and Devin are continuing to lead the ST points standing with four races remaining. Tell us about your strategy for the final four races to remain on top. What was your best result at Road America, and in what series and car. Share your story. You and Devin are new co-drivers this year but seem to make a compatible pair. How’s it going? How do you like the IMSA pre-race Fan Walk and the opportunity to interact with great fans like here at Road America? How do you like Road America and what’s been your best race result there? Last year weather was a factor when the race time was cut short. How do you like racing in the rain, especially a track like Road America? With the combination of long straights and 14-turns, what’s the trick for a best lap around Road America? The fans at Road America are known to be knowledgeable and true road racing fans. Who is a race driver you are a fan of (past or present)? 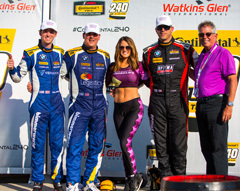 BimmerWorld Racing’s Devin Jones and Nick Galante catapulted to the top of the Street Tuner (ST) point standings of the IMSA Continental Tire SportsCar Challenge series with their second victory of the season on Saturday at Canadian Tire Motorsport Park. Their No. 81 Veristor/Legistics BMW 328i (F30 chassis) also leads the class’s VP Fuels Front Runner Award standings at the season’s halfway point. James Clay, owner of the Dublin, Va.-based team, and his co-driver, Tyler Cooke, finished eighth in the Grand Sport (GS) class Saturday. They are second in that division’s point standings, just six points out of the lead, with their No. 82 OPTIMA Batteries BMW M4 GT4. Jones, of Mooresville, N.C., won the ST class pole Saturday with a time of 1:31.378, setting a new track record. He immediately broke away from the pack, building up as much as a 40-second lead during the first half of the two-hour race. Jones also set the class’s fastest race lap on lap seven with a time of 1:32.944. But the victory was not certain for the BMW team until the very end of the race, as a full-course caution on lap 46 obliterated its huge lead. Galante was second until he took the lead for the final time just six laps from the end when the leading MINI stopped off course due to mechanical issues after contact. The race stayed green as the MINI was removed, and that sealed the victory for the BMW squad. Galante took the checkered flag with a 5.205-seconds margin of victory over the runner-up. Clay, of Blacksburg, Va., qualified 13th in the GS category with a time of 1:25.228 on the flowing, 2.459-mile, 10-turn road course. He broke into the top 10 just 44 minutes into the race by passing Dillon Machavern in the point-leading Porsche and was still in that position when he pitted under green flag to hand the car over to Cooke about 10 minutes later. A limping ST car stopped at the exit of Turn 5 with about 51 minutes remaining, bringing out the only caution of the race, and regrouping the field. The pits roared to life as multiple GS drivers pitted under that yellow to top off with fuel, including Cooke. The Fort Lauderdale, Fla. driver dropped to 12th as other GS cars gambled with fuel strategy but had raced back in the top 10 with 39 minutes remaining. Cooke battled with Eric Foss for ninth place as the pair swapped that position several times. Cooke’s hard driving finally awarded him the spot with 24 minutes remaining in the race, about the same time that one of the entry’s main title contenders made an unscheduled pit stop for brake issues. In a multi-lap chess match, including a lapped car and fellow BMW driver Greg Liefooghe, Cooke snuck past Paul Holton to snare eighth place with 15 minutes remaining in the race, where he ultimately finished. This race will air on FOX Sports 1 from 11:30 a.m. to 1:30 p.m. Eastern time on Sunday, July 15. 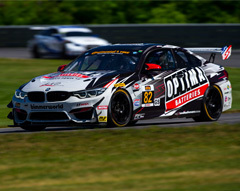 The season continues with Round 6 on July 20-21 at Lime Rock Park in Lakeville, Conn.
BimmerWorld Racing owner James Clay announced today that he will compete in this weekend’s Pirelli World Challenge doubleheader at Road America in Elkhart Lake, Wis. He will drive his No. 83 BimmerWorld M4 GT4, the same platform that he and co-driver Tyler Cooke are using in the IMSA Continental Tire SportsCar Challenge Series, where they are currently second in the top Grand Sport class, only three points out of the championship point lead. The Pirelli World Challenge (PWC) series supports IndyCar at Road America, and a large crowd is expected to be on hand at the 4.048-mile, 14-turn road course near both Chicago and Milwaukee. Clay will compete in the GTS class in the doubleheader at 4:35 p.m. Saturday and 2:45 p.m. Sunday (Central Daylight time). There are 25 entries in his class and 40 overall. OPTIMA Batteries, Red Line Oil, Performance Friction Brakes, Lifeline Fire and Safety Systems, and Powerflex sponsor the Blacksburg, Va.-based driver’s car. Clay is no stranger to PWC, and he’s excited to return to one of his favorite tracks. “The Balance of Performance is different in Pirelli World Challenge for all cars, but I look forward to seeing how we’ll fare,” he said. “This is our first Pirelli World Challenge event since the end of the 2009 season after running Touring Car since 2002 in E36, E46, and finally E90-chassis cars. Practice sessions will be held on Friday at noon and 6:45 p.m. and 8:45 a.m. on Saturday before Clay’s qualifying session at 9:40 a.m. Saturday. All times are local. The GTS/GTSA competition will be highlighted at 9 p.m. Eastern on Wednesday, July 11 on the CBS Sports Network. The races will also be streamed live on SiriusXM satellite radio. Live timing and scoring will be available through links on the series’ Web site at world-challenge.com. ABOUT: BimmerWorld is renowned as a leader in BMW aftermarket and tuning expertise. It competes in multiple series in both the brand-new BMW Motorsport M4 GT4 and a turbocharged BMW 328i (F30 chassis). The racing arm of the Virginia-based outfit has become a routine winner and championship contender, which provides both proof of concept and valuable experience to support the company’s parts business and the customers it serves. 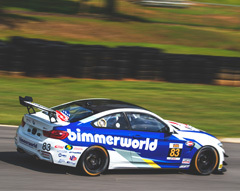 BimmerWorld Racing owner James Clay and co-driver Tyler Cooke recorded their best finish of the IMSA Continental Tire Sportscar Challenge series so far this year when they placed third in the Street Tuner (ST class) Saturday at Lime Rock Park with their BimmerWorld Racing No. 84 OPTIMA Batteries turbocharged BMW 328i (F30 chassis). Ari Balogh and Greg Liefooghe also had an excellent result in the two-hour contest, as they placed sixth in a similar car fielded by the Dublin, Va.-based team, the No. 81 Powerflex BMW, to duplicate their best result of the season to date. Clay, of Blacksburg, Va., qualified fourth, just 0.360 of a second off the pole-winning time for the 1.53-mile, seven-turn road course about 100 miles from New York City. He set the car’s fastest lap of the race on lap four and remained in fourth place throughout his stint until he led four laps around the halfway mark when the top three cars pitted under green. He pitted shortly thereafter for fuel, fresh Continental tires, and to turn the car over to teammate Cooke, of Matthews, N.C.
Cooke was back in fourth place only seven laps later. He advanced to third on lap 102 with about 14:20 remaining when the drivers who had been second and third tangled in front of him. The one who had been third got the worse end of that tussle and ended up in a tire barrier, and a little later Cooke brought his BMW home for the final podium position. Balogh, of Menlo Park, Calif., qualified 16th but he’d advanced to ninth before most of his rivals began their pit stops, and he was fourth when he pitted under green to turn his BMW over to Liefooghe, of San Francisco. The latter was ninth at the halfway point before rising to sixth at the finish despite a track that was getting more slippery by the minute. The race will be shown on FOX Sports 1 on Sunday, July 30 from 11:30 a.m. to 1:30 p.m. Eastern. The next event is Aug. 3-6 at Road America in Elkhart Lake, Wis. More information is available at imsa.com. “Not bad. Finishing third at Lime Rock is like a win for pretty much any car in the field. It was a great race. The track really fell off at the end, but we were running a consistent pace. We held it in fourth and then moved into third. “The car was good. We didn’t have the pace in qualifying but in the race, we were really good. I think we can be happy with the results. The car ran really well. We found some speed this weekend. I’m pretty happy. Ari drove the first stint very well, and the car was really good. The No. 84 OPTIMA Batteries BMW 328i of qualifying driver James Clay and co-driver Tyler Cooke started from the pole position in Saturday’s IMSA Continental Tire SportsCar Challenge race at Canadian Tire Motorsport Park, but handling issues during the race resulted in an 11th-place finish in the Street Tuner (ST) class after 2 hours and 30 minutes of competition. The challenge was evident from the start, as two cars got around Clay on the first lap and he was put on the defensive immediately. He was sixth at the 30-minute mark, but he put his head down and advanced to fourth by lap 43 when the race’s only full-course caution waved with 65 minutes gone. He pitted under that yellow for the driver change. Cooke ran most of his stint in seventh place despite a healing broken wrist, but the car faded to 11th at the end. Jerry Kaufman started ninth in class in the team’s sister car, the No. 81 BimmerWorld BMW 328i. His co-driver, Kyle Tilley, took the checkered flag in 15th position. There wasn’t much practice time due to rain and incidents, but they were both fairly pleased with the setup they chose. Both drivers think the team will do even better at the next race, which should favor their BMWs more than this particular track did. The Continental Tire SportsCar Challenge race will be broadcast on a tape-delayed basis on FOX Sports 1 starting at noon EDT on Sunday, July 17. The next event, Round 6, will take place at Lime Rock Park in Lakeville, Conn. on Saturday, July 23. 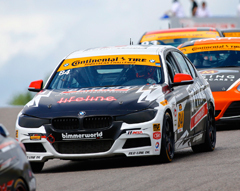 With an expanded four-car roster ready to vie for the 2014 Continental Tire Series Street Tuner Championship, the Virginia-based BMW experts at BimmerWorld have secured an impressive array of commercial backing and technical support to bring their goals closer to reality. Team owner/driver James Clay discussed many of the companies whose branding will be carried next season, including some that have become synonymous with BimmerWorld’s striking fleet of BMWs. BimmerWorld’s reputation as an elite BMW aftermarket and tuning specialist has been amplified through relationships with numerous technical partners. Each company Clay has assembled within the BimmerWorld fold has brought unparalleled cornering, braking, and acceleration performance to the professional team and BimmerWorld performance customers alike. “With the change in suspension regulations this year, we are once again able to align ourselves with the staff of Motion Control Suspension (MCS) with whom we have worked since 2003,” Clay explained. “Their new MCS brand and product line is the next evolution of their premium race-winning damper designs and we are excited to be able to use the same products we have been selling to our customers and using on our other program cars in our professional program. This renewed technical partnership is a tremendous asset as we prepare to fight for the 2014 Championship. Packed race tracks with grids of 60 or more cars can present significant engine cooling problems, which BimmerWorld continues to address and overcome with help from Red Line Oil and C&R Racing. “Red Line Oil has been in our cars since day one at BimmerWorld Racing,” Clay noted. “We have always been happy with the results in a variety of applications, and with the challenging temperatures in our new turbo-engined BMW F30, Red Line gives us critical durability and protection in a very challenging environment. Producing horsepower, torque and transmitting that energy to the ground has been entrusted to two BimmerWorld staples. “Diffsonline continues to be a strong technical partner,” Clay remarked. “Focused on our non-engine driveline, they have provided our engineers with the tools to continue to improve our cars’ performance, and helped reduce critical driveline failures. With the release of the F30 last season and continuing work this year, Diffsonline continues to develop new solutions as needed for this new platform. Known for sharing close quarters and trading paint throughout each race, Bassen Autobody will once again keep BimmerWorld’s Continental Tire Series cars smooth and sparkling. “The Bassen Autobody team will have more work than ever with four BimmerWorld cars to keep on track, but we can sleep knowing that when the unexpected pops up, we have capable partners like Bassen to handle it,” said Clay. In addition to the partners listed above, BimmerWorld will also represent BimmerForums, Chin Motorsports, LaminX, Miller Welders, Racetech, Rays, Rogue Engineering and Sparco in 2014. 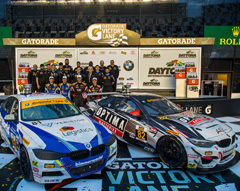 Next up or BimmerWorld is this weekend’s Roar Before The 24 test at Daytona International Speedway, a precursor to the season-opening Continental Tire Series race on January 24 at Daytona.